Pacquiao-Vargas fight on PPV Saturday Night! Is Jesse Vargas a legitimate champion? Can Manny Pacquiao win another title? The 27-year-old Vargas (27-1, 10 KOs) defends his WBO welterweight championship against the ageless Pacquiao (58-6-2) on Saturday night in Las Vegas at the Thomas & Mack Center. Vargas comes into the fight having TKOed previously unbeaten Sadam Ali in March to claim the WBO’s vacant welterweight title. Pacquiao, 37, most recently came out of retirement and defeated Tim Bradley in April. 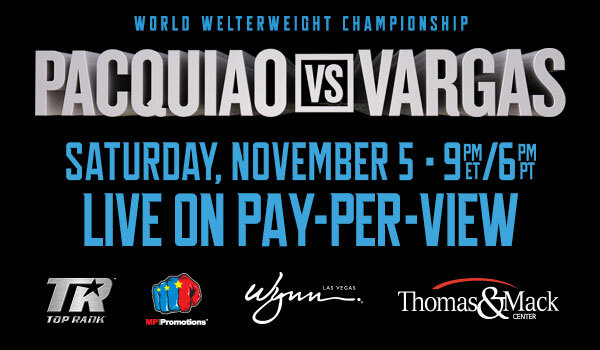 You can order Saturday’s fight through your set-top box* or by calling TDS at 1-855-696-8368.